Nearly 30 matches in, and we're finally a third into the IPL. It's great to see that, for once, one or two teams aren't running away with it. How often do we have a six-way tie for anything? Usually, if there are six incompetent teams sharing points, it's the bottom 6. All the better to slate the Deccan Chargers - they really must love that basement. Here are the standings, as I write this. In 15 hours or so, two out of the current top three will share the lead with 10 points. By "surprise packages", I don't mean an unexpected parcel delivered to your door, with a clearly audible ticking noise coming from it. Or maybe I do. I'm not sure. Anyway, the teams that have done better than expected are the Pune Warriors (India) and the Delhi Daredevils (also India, but they aren't all smug and in-your-face about it). Delhi looked a little short on bowling after the auction, but Morne Morkel has led the attack superbly, supported ably by the tight-as-a-tiger Irfan Pathan, Umesh Yadav, and the excellent Shahbaz Nadeem, whom I earlier picked as a player to watch. Also, it has helped that their purchase of KP has coincided with his stunning return to form - he has propped up an out-of-sorts batting line-up that will look ridiculously good when Warner joins the side. "Come at me bro! Oh, wait, I was only kidding, mate. Take two steps back or I'll call my mum." As for Pune, they have benefited from Ganguly not being awful. It's just splendid that Jesse Ryder loves money was miraculously cured of his mental ailment just before the IPL, and that Marlon Samuels was allowed to chuck his darts. Most of their players have chipped in, Steve Smith more than the others. His lower-order striking has been an unexpected boon, even though it's quite the eyesore. Rahul Sharma has gone for a few at times - there have been a couple of games where he has only bowled two overs, so it's strange that Ganguly hasn't opted for Kartik ahead of him. What's the official term? Ah, yes. Crap. The three best teams on paper occupy the middle of the table, with CSK slightly ahead on NRR. Despite having more or less the same team for their entire history, Chennai have found it tough to get going this season. 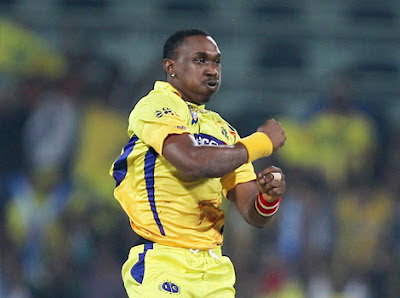 In fact, their newcomers have been their most consistent performers - Faf du Plessis has delighted many in his nearly Pietersenesque innings, while Dwayne Bravo has chipped in in every department. He also does an excellent impression of Jesse Ryder. So what has gone wrong for them? Their core Indian players haven't been anywhere near their best (or even average). I'd have to say it began with Murali Vijay - he was key in CSK's previous successes, but he has sunk like the proverbial Titanic. Oh, wait, that's a real ship. Never mind. Bangalore are a bit easier to diagnose. The batting has come off most of the time - Gayle, Dilshan, deVilliers are all in form - with a couple of exceptions. What they haven't been able to do is defend their scores. They only have one known T20 wicket-taker, and Murali (their highest wicket-taker, has played half their games) has had to remain on the bench because Vettori's the skipper. Well done to whichever asshat made that decision. You had a chance to give India's future captain some skipper-practice in a domestic tournament, and you gave it to a man who doesn't want to lead his country anymore. Good job, you hack. And well done, again, for spending money on Vinay Kumar. Does his economy rate of 9.2 please you? I'm probably even more annoyed at the Mumbai Indians, probably because I support them. It's one thing if a team loses due to under-performance, but these are huge selectorial problems. It was a decent start, with Levi making his only telling contribution at the beginning of this season. Mumbai have had issues with openers ever since age caught up with Jayasuriya (he was running quite slow, age didn't have to step on the gas). Once Levi's form deserted him, Mumbai tried Jacobs and Franklin at the top. Why Jacobs? He wasn't very good last year, and there were more explosive batsmen lying around. Aiden Blizzard and an in-form Herschelle Gibbs (wasn't he scared of being in Mumbai? when did that change?). To be fair, injuries to their best batsman and bowler (Sachin and Malinga) have hampered them. What looked like a promising middle-order (Rohit Sharma, Rayudu, Pollard) haven't all fired at the same time, barring maybe one match. Oh yeah, their captain has been rubbish too. Kolkata, Rajasthan, Punjab and Deccan. Exactly where we expected them to be. No more, no less. I'll deal with them quickly. KKR: With Gambhir, Kallis and Lee now hitting their stride with excellent support from Rajat Bhatia (best trundler EVER) and Sunil Narine (best mystery bowler EVER until he's figured out and another one comes along), they are a shoo-in for a top-four spot unless SRK starts delivering stuttering team-talks. RR: As usual, making do with their limited resources in the best way possible. Dravid and Rahane's finger-lickin' good partnership at the top has been complemented by the big-hitting Shah and Hodge, while Brad "the tongue" Hogg has enjoyed his second coming. Also, well done to them for finding their own token Trinidadian all-rounder, Kevon Cooper. Every team must have their Pollards or Bravos. KXIP: They aren't going to get anywhere making stupid decisions like dropping Dimitri Mascarenhas and not playing Abhishek Nayar and Bipul Sharma. Ryan Harris (if he does eventually join them) should bolster their attack, but they are over-dependent on Shaun Marsh and Dave Hussey at the moment. DC: Dale Steyn is bowling his heart out, but the batsmen just aren't making enough runs. They have the weakest contingent of Indian players, their most high-profile being Amit Mishra. HA. Darren Bravo will be joining them soon, so that should boost their line-up. He may look like and be related to and bat like and have similar statistics to Lara, but he's no Lara. Still, he could do better than Cam White. Er, yeah. I'll be back after another third of this season has been completed.